Greetings from the depths of our dark livingroom. Actually, this is an example of that old song -- "Only a child can do it." You're too young to remember that song? Wellll, basically it talks about how children can figure out new technology easier and faster than adults can. I have no idea how to use the picture taking capabilities of my cell phone. However, without anyone instructing her, the 9-year-old has figured out how to take pictures both with MY cell phone and my husband's I-Phone. He discovered her new ability when he found this photograph on his I-phone. 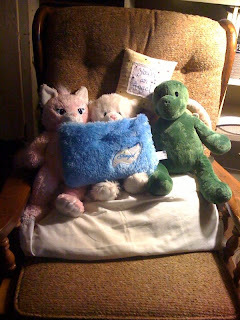 There they are, the 9-year-old's Build-a-Bears, carefully arranged on a chair in our livingroom. Surprise! My tech goal for March was to learn how to send pix from my phone to my laptop. My husband set up the stuff, and now I can. We have one gadget on order so my laptop has my own thingy to receive the Bluetooth signal. And I need my teen daughter to do a shortcut on my phone so that the camera doesn't take me five minutes to find every time.